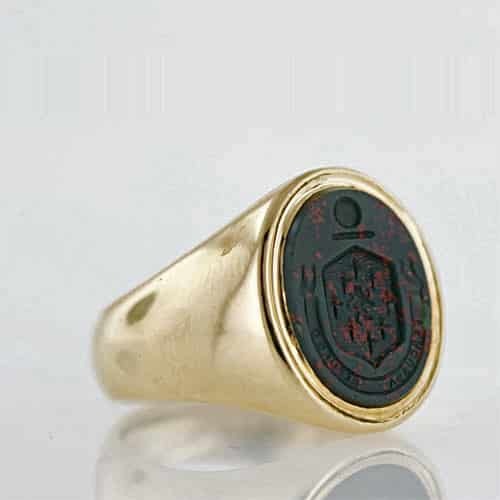 Bloodstone Intaglio Signet Ring with a Coat of Arms Seal. Tiffany & Co.
Bloodstone is a polycrystalline variety of chalcedony (quartz) with a dark green hue and red or orangey patches. These iron oxide dots or patches are dispersed throughout the stone. As with most chalcedonies, bloodstone is very tough making it suitable for glyptographs rendered as seals, cameos, and intaglios. Heliotrope, an alternative name for bloodstone, is derived from the Greek words for “sun” and “turning”. The ancient historian Damigeron stated: “Now, if it is put in a silver basin full of water and placed against the sun, it turns to it and makes it as if bloody and cloudy.”2 Blood jasper is another common moniker for bloodstone. Some linguistic confusion can arise from the German name blutstein given to hematite and its similarity to the word bloodstone but in English the name bloodstone indicates this dark green jasper “sprinkled” with red or orangey specks. Christian legend held that the red spots represented the blood of Jesus Christ as it dripped from his wounds while he hung on the cross. As a result, many Christian cameos and intaglios and sculptures were carved from bloodstone and carried as Christian amulets. They believed that wearing bloodstone increased longevity and made one more courageous and wealthy. 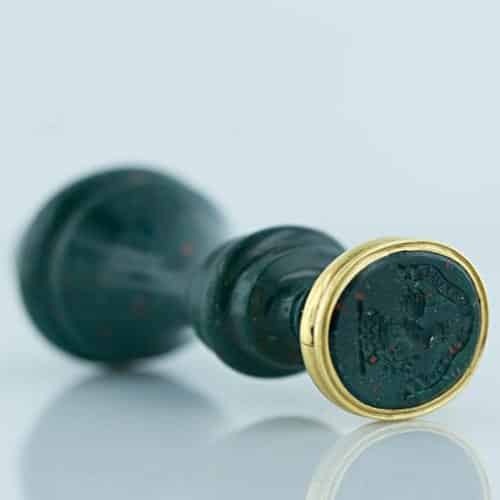 Other attributes assigned to bloodstone include the power to avert disaster and stimulate blood clotting after injury, making it a talisman against hemorrhages. Metaphysical attributes given to bloodstone include altruism and bringing forth natural talents. Bloodstones are associated with the navel, base, sacral and heart chakras. India and Russia (Ural mountain range) are the main producers of fine quality bloodstones. Kunz, George Frederick. The Curious Lore of Precious Stones, New York: Bell Publishing Company, 1989.